13 wins & 19 nominations. Excellent direction, photography and set design enliven this account of Wing Chun instructor Yip Man's life before he moved to Hong Kong. 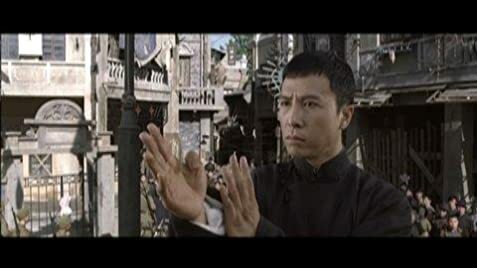 Every Wing Chun instructor today tries to make a lineage connection to Yip Man to legitimize their teaching so he is a very important figure in Kung Fu. Donnie Yen portrays the master with intense reserve and is possibly the best acting in his career. It surprised me for sure. The story line of this film is invented as historical accounts show Yip Man to have been a police officer in the time frame this film covers, not staying at home and only practicing kung fu as depicted here. Also the film claims that he refused to teach anybody but that is also not true. He left for Hong Kong a few years after WW2 not in the middle of it as this film presents. The plot with the Japanese army seems invented although they did ask him to teach the troops which he refused. However the film muddies up the historical record, that is not to say it isn't a great film. Sammo Hung's choreography is exceptional and a throwback to his great kung fu films of the early 1980's. The martial arts are done with great respect to traditional styles although some wire work is used to assist the actors with the difficult acrobatic moves. No flying across the room in this film. Although the ending is a little abrupt, this is one kung fu film that can be recommended to people who don't like these films. Highly recommended. The Japanese soldiers in the film wear modern U.S. military ribbons. In the bedroom, when Yip Man is reading, there is a modern lamp made of matte metal.